As a follow-up to their fun, light-hearted, crowd-pleasing holiday show A Hunting Shack Christmas, Yellow Tree Theatre is presenting Clybourne Park, a darkly funny and challenging play dealing with heavy and timely issues of race, class, gender, and gentrification. This is one of the things I love about Yellow Tree; they don't pander to their suburban audience with easily digestible fare, they challenge them with plays that might take them outside of their comfort zone. One of the biggest areas of improvement for Yellow Tree, now in their 8th season and taking their place among the heavy hitters in town, is increasing diversity on their stage (and in the audience). I'm thrilled that they've chosen two plays this season that tackle race head on (this play and the upcoming musical Violet), and hope that this trend of diversity, and even non-traditional casting, continues. 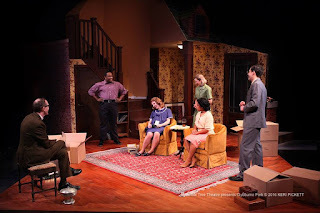 But back to the play at hand - Clybourne Park is a funny, edgy, brilliantly written play (it won the Tony in 2012) and this production does it justice with a top-notch cast and director. 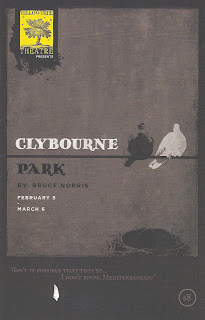 Act I of Clybourne Park shows us the other side of the classic American play A Raisin in the Sun, in which a black family buys a house in a white neighborhood and receives a visit from neighborhood representative Karl (the one character to appear in both plays), who offers to buy them out. The house in question* is owned by Bev (Laura Esping) and Russ (Patrick Coyle). Or rather, was, as they're selling to move to a new location and a better life. Bev is busy packing boxes with the help of her black housekeeper Francine (Joetta Wright), while Russ sits by eating ice cream and reading a magazine. They've had sorrow in this house, the specifics of which unfold throughout the first act. The couple is visited by a few friends, including Pastor Jim (Dan Hopman), and Karl (Jason Peterson) and his deaf wife Betsy (Ashley Rose Montondo). Karl pleads with Bev and Russ not to sell to a "colored family," as his patient wife sits by not following much of the conversation. He pulls Francine and her husband (Ricardo Baeird) into the discussion, who politely refuse to take part and make their exit. Things get heated as Karl won't give up and Russ won't give in. The house is sold, and Act II takes place 50 years later. We see the same cast inhabiting different, although sometimes slightly similar, characters. A white couple has bought the house and is planning to make significant changes. They are meeting with an African American couple who lives in the neighborhood and has brought a petition against them. Both couples have brought their lawyers and are trying to work through the petition, which never seems to happen as other discussions take place. The discussion soon devolves into a trading of racist jokes. Both acts feature awkward, uncomfortable, and down-right ugly conversations about race, and it's fascinating to observe the differences and similarities between the two time periods. The way that the sexes and the races interact with each other differs greatly between 1959 and 2009, and the language they use is different, but many of the underlying themes are the same. Director Craig Johnson beautifully leads his cast through these thorny issues and sometimes offensive dialogue. I love plays where people talk like real people talk - stammering, starting and stopping, and sometimes talking over each other - and there's a lot of that here. These conversations feel real, and difficult, and sometimes awkward. Everyone in the cast does a wonderful job of exploring two very different characters in two very different time periods, while maintaining the thread of similarity. Playwright Bruce Norris repeats certain words, themes, and movements in both acts, drawing some nice parallels and contrasts. The house is another character in this play, and it's important to see the difference between pretty 1959 in Act I to run down 2009 in Act II. Eli Schlatter's set does that well, as a rug is removed to reveal scuffed floor, and bare patchy walls replace the flowery wallpaper. And while the stage may not be as grand or the transformation as dramatic as seen at the Guthrie a few years ago, the intimacy of the Yellow Tree stage brings a different dimension to the play, drawing you right into these awkward conversations whether you like it or not. Clybourne Park is a new classic based on an old classic, telling a very American story of changing neighborhoods, demographics, and relationships. 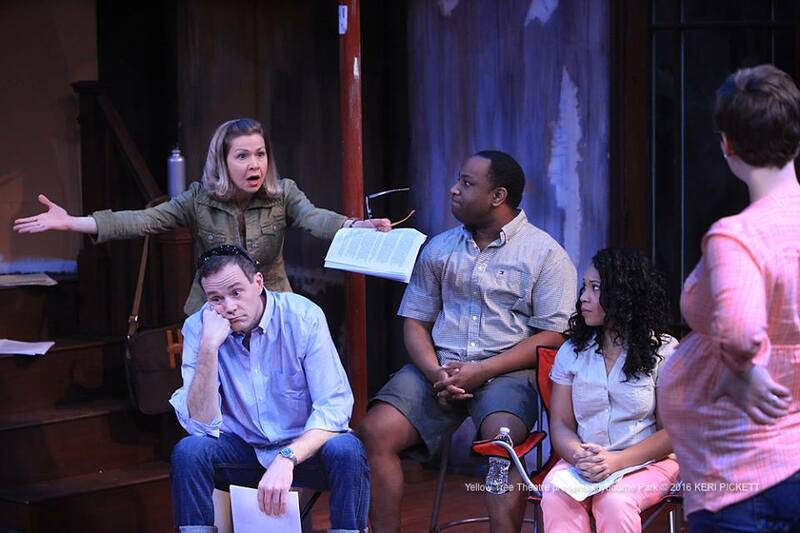 The play doesn't offer any answers, but it does ask questions and hopefully spark conversations. As Bev says in 1959, the world would be a better place if we treated everyone as our neighbors, but unfortunately we haven't learned that lesson in the last 50 years. Maybe in the next 50. 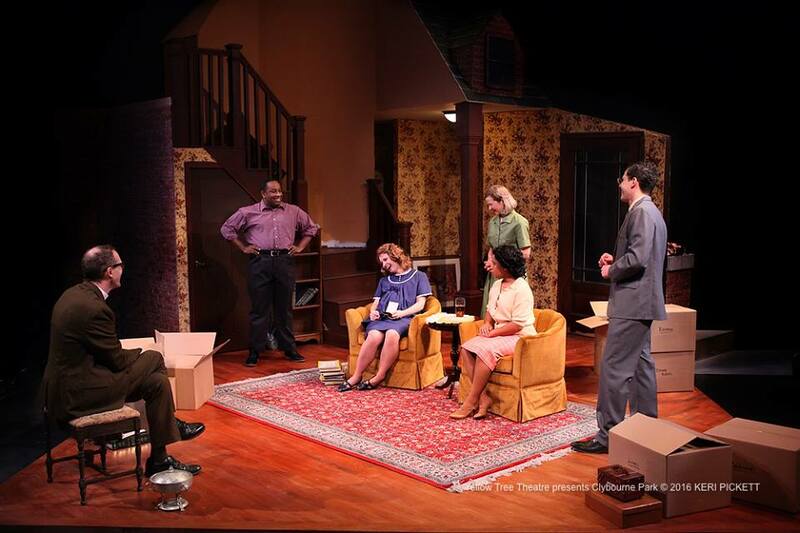 Clybourne Park continues at Yellow Tree Theatre in charming downtown Osseo through March 6 (discount tickets available on Goldstar). *Plot summary borrowed from my blog post about the Guthrie's 2013 production of Clybourne Park because I'm lazy efficient.